There are two gift categories that can be very easy to give. Things that the recipient has that are broken, super old, nearly broken or that they could use another pair of. Things that are just what practically everybody has on their TOP 5 of their wishlist (often at their number one, but they haven’t voiced it quite yet). Want to know more about those things? a memory upgrade for their paiiiiinfully slllllllow computer. Why On Earth Would You Want To Give These Gifts? You might be thinking, Haydee, these gift ideas are silly! Why would I give someone this? Well, my friend, my answer to that is that you would be doing two tasks in one (sorry, I didn’t want to include the phrase “kill two birds with one stone” but you get my point). Second of all, you’re going to eliminate one worry for the people that receive this gift. (And with so many worries that people may have resolving a health-related issue or an issue for an item they most likely would like to use daily is a huge deal). Take me, for example. Out of the list of things that we need to function optimally physically, there is one item on there that has given me soooo much grief FOR YEARS that you would not even believe it. Oh, and by the way, it’s not that I haven’t upgraded this item, because I have. So in my case, having an extra item of this category would be so wonderful because if the original ever fails/breaks/lets me down, I would have a backup. But then again, I’m sure that not many people would think of every gifting me a second thing so THAT’S why I’m sharing this with you. Get it? And let me say that I’m NOT rough with my things, on the contrary. So while these things may not be the sexiest gift out there… one thing is for sure, and that is that if you know the person whom you’re gifting one of these items to very well and know that they have been complaining about something for longer than you think is cool/believable/bearable…… then help them to finally do something about it. You’ll stop hearing that complain and they’ll be super thankful. Mmmm, what can I say? Let’s cut down to the chase. Practically everybody I know (that you know or maybe in the world who’s got their basic needs covered (food, water and shelter) would want a box containing a gadget with an apple icon on it. People who are hard-core Apple fans (yep, that’s me even though I don’t feel the need to have every item on the suite or the latest of each item). People who haven’t tried Apple yet (but oh my goodness, they have absoluuuuutely noooooo idea what they’re missing out on and if they were to try them they would become instant converts, I think. People who hate Apple (for their own meticulous reasons… we’ll give them that). But this percentage, I’m willing to say…. is very small. But, do you see the trend? Almost everybody wants an Apple product and in most cases, the newer the model the better. But there are people (me included) who have waited yyyyyyyeaaars for an Apple product or category. Years. Painfully long years. And I know that I’m sounding all materialistic… but let me explain. I just want to put it out there, that there are people who either have voiced that they want an Apple item OR that have some Apple items already that would LOVE to get an Apple item. The only difference is that now, they don’t write letters to Santa like they did when they were kids, or if they tell Santa, often he doesn’t get the “memo” ( a..k.a. hint… wink, wink). Let me put it this way… unless you KNOW FOR SURE that whomever you’re gifting an Apple product absolutely h-a-t-e-s Apple, you can’t go wrong with any Apple product. Since Apple products don’t need a lot of introduction because they’re so well known, I’ll keep this list as short as sweet as possible. Oh, and you can bet for sure, that these items are sweeeeet! Apple products are what you could say the coolest gifts in town. Before we get to the list, however, let me share how buying Apple products from Amazon works. You can buy these items new or used by many sellers. If you’re suuuuper concerned about the quality of the products you’re buying, I recommend that you purchase your items through an Authorized Apple reseller like you’ll see on this link. But even if you buy a product from a regular Amazon seller, you know that Amazon has amazing customer service, so there shouldn’t be a problem. Just make sure that you read through descriptions, questions, reviews, etc. so that you make the most informed decision for your situation. Now, let’s get to the Amazon rundown. For some reason, this item is one of the top items to gift this Holiday Season. It’s not my top pick, but it is after all it’s in part as popular as it is because it’s Apple’s newest product. So if you or anybody in your life wants it and would like to buy this item on Amazon, I have to give you a BIG WARNING: Some styles are limited. You will see a phrase underneath the price that says, “Only ___ (the #) left in stock” on many of the styles fulfilled by Apple on Amazon (and by other sellers). When buying an Apple Watch, consider the style, personality, use and favorite color of the person whom you’ll be gifting it to. If that’s too hard, perhaps you might consider getting them a gift card so that they can pick their own watch. That makes it pretty tempting to upgrade your iPhone, but it’s your call. I personally like that this is a bigger iPad… that more closely replaces a notebook… or feels like it. And the gold color? DIVINE! But any of the iPads are prone to be a huge success. And by the way, iPad touch, IPad Nano ($149)and IPad Shuffle ($49) are still available. These are the least expensive items on the lineup…. and not likely to be what people are going to be head-over-heels to receive, but they do make a nice gift. “Light. Years ahead.” is the official Apple description. You’ll have to buy this at the Apple Store. If you haven’t tried even the older models of AppleTV you’re in for a treat. So much so, that you’ll hardly watch cable TV. Seriously. If you’ve ever owned any gadget you know that you can hardly get away with buying just the gadget. You need to buy batteries, things to protect it, things to use them with and even electric plugs (heck, did you know that even dishwashers don’t come with electric plugs anymore. You need to buy them separately. Holy moly, right!?). For those people in your life who seem to have everything and the latest iPhone as well, this might be a nice gift. See it at the Apple Store. You can buy the iPad Pro and while you’re at it, buy the Apple Pencil. Or you can gift the pencil to someone who already has the iPad Pro. The iPad is meant to be by your side to capture ideas. Big, long, audacious ideas. And a keyboard makes the recording process much easier. You can find the better price at the Apple Store. In The End, What Makes Apple Products So Alluring? So Apple provides satisfaction for many people with various interests. In my opinion, the reason why Apple products are so alluring is because they allow you to dream, to reach for the moon knowing that if you land among the stars it’s going to be okay because they allow you to imagine yourself as being more productive, more creative, more fulfilled and happier with what you can achieve and what you can capture digitally. They have become a part of our society in a way that it’s hard to imagine society without them. So in the end, whether you want to buy someone something to make them feel better physically, something that will allow them to have what they have better or to delight them with one of the things that they want the most or will use the most for years to come (which are Apple products)… it’s up to you. Consider the recipient, consider your budget, but most importantly consider your heart and the intention with which you give gifts. Gifts from the heart are more meaningful and more heartfelt. It’s not about how much or how little you spend, it’s about what you would like the gift to represent in their life. Do you have any awesome gift ideas that would fall into the broken category that you would like replaced this Christmas? What’s your favorite Apple product? 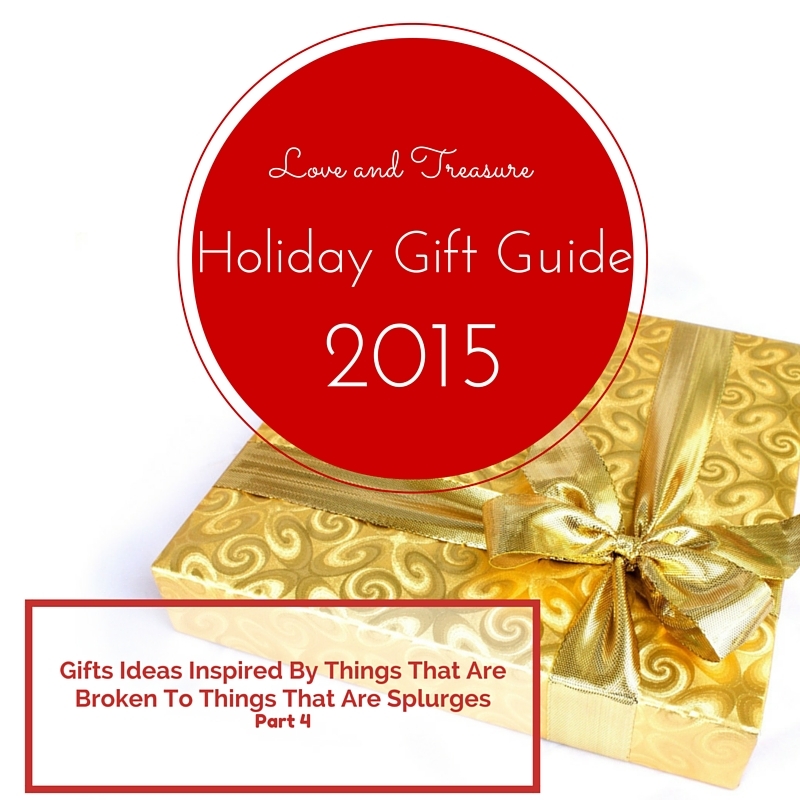 Love and Treasure Holiday Gift Guide 2015 Part 2 in which I shared the Gifts for Him. Love and Treasure Holiday Gift Guide 2015 Part 3 that has ideas for the kids and tween in your life. What would the Holidays be without them? And, like I said last time, even if you dislike all of my gift ideas (which I hope you don’t ? ) , or you want to buy a few or all of your gifts on Amazon that you had already thought out and planned to give, since I am an Amazon affiliate, feel free to use this link to do all of your Holiday shopping and purchases year-round… and you’ll be supporting this blog in the process, something that I totally appreciate).